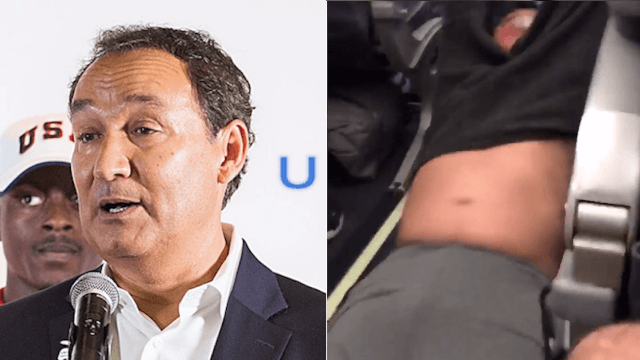 United CEO's 'sorry not sorry' response to doctor dragging video infuriates critics even more. When the man refused leave the plane of his own accord, police were called and the man was dragged down the aisle while horrified onlookers protested how he was being treated. This isn't great PR for United, who just a few weeks ago found themselves being heavily criticized for not allowing two girls in leggings to board one of their planes, citing a dress code. Many people found this to be a sexist move, since men on the same flight were wearing shorts and the airline apparently had no problem with that. In an interview with CNBC on Monday, Gordon Bethune, the Chief Executive of United Continental Holdings (the former parent company of United Airlines) said, "Denied boarding is usually handled with a whole lot more maturity," apparently referring to the man's unwillingness to leave the plane. Bethune continued, "[United] tries to do a professional job, but not everybody on the plane is professional," which is how he explained the "scene" on Sunday. "This immature reaction disturbs us all," Bethune said. This is an upsetting event to all of us here at United. I apologize for having to re-accommodate these customers. Our team is moving with a sense of urgency to work with the authorities and conduct our own detailed review of what happened. Being dragged down an aisle by police for refusing to give up a seat you paid for, on a flight you needed to be on, is hardly "re-accommodating." This apology strikes as being the 'sorry not sorry' variety. Hopefully, the airline will come up with a better explanation for how this whole debacle happened because Twitter is not having United's response to all this.